Southern Amazonia is home to one of the most dynamic agricultural frontiers on the planet. Since the 1990s, soybean, maize and pasture have been slowly progressing from Brazil’s Cerrado (or savannah) into the Amazon biome. Many individual land and water decisions are required in this context: when and where to clear land for cropland and pasture, what and when to plant, what kind of soil and water management should be undertaken, etc. The project “Integrating land use planning and water governance in Amazonia: Towards improving freshwater security in the agricultural frontier of Mato Grosso” supported by the Belmont Forum (Freshwater security) brings together an international team of researchers from Canada, the U.S., Germany and Brazil to study land and water in Southern Amazonia. My research focuses specifically on crop water use within this project. Cropland and pasture in Southern Amazonia are almost entirely rain-fed and therefore their productivity highly depends on the timing and frequency of precipitation. Although not currently a common practice in the region, irrigation remains a possible option for future production. To understand how much irrigation will be required, we must first understand how much water is consumed by cropland and pasture. 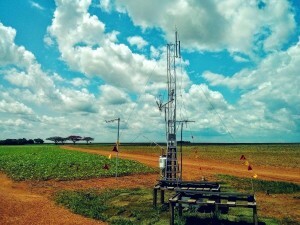 Measurements are underway to determine the amount of water consumed by soybean and maize fields at a farm located in Lucas do Rio Verde, Mato Grosso, Brazil. An open path CO2/H2O eddy covariance system is currently measuring evapotranspiration and CO2 fluxes from both soybean and maize crop canopies. This system is installed on a 7 meter high tower (see photo below) alongside which we have also installed about 20 sensors that will capture the full water and radiation balances of the crop canopies: e.g. soil volumetric water content, water potential, photosynthetically active radiation, shortwave radiation, etc. The tower is currently online and data collection in underway; the system will be operational for at least two harvests of soybean and maize.